Clean and shiny sink definitely delights the eye. But over time, it becomes impossible to achieve cleanliness, by simply wiping its surface with a sponge with soapy water. Food waste and soap plaque can accumulate in the kitchen sink; with time water stains and rust appear, etc. Today, together we will try to return cleanness and shine your sink and will learn how to care for it properly. • Always when using different detergents or cleaning products, wear rubber gloves. Household chemicals and hot water can negatively impact the condition of your hands. So do not forget about this simple method of protection. • Never mix different chemicals to clean the sink. Substances in their composition can react and the consequences of their impact on your health and on the sink surface can be unpredictable. • Always read carefully the instructions to all the agents that you use. Do not leave substances to act for longer than it is recommended by the instructions. • Be sure to rinse the sink thoroughly after applying the cleaning agent. • For removing limescale from a tap you may use a simple domestic method – heated vinegar. • For sink to shine, and to get rid of water stains and streaks, wipe it dry with a paper towel or a cloth. • After each dish washing, clean the sink / washtub from the food residue and rinse it with warm water. Once a day clean it with a soft sponge with detergent. For the nighttime it is always recommended to wipe the sink dry in order the water stains not to penetrate in surface, and not to create a favorable environment for the growth of germs. • Do not use any aggressive cleaning products for your sink. Agents must be suitable for household plumbing, otherwise you risk to spoil the surface and do much harm your health due to toxic fumes of such products. It is possible to remove stains from the sink made of artificial stone with conventional toothpaste. Baking soda mixed with water to a paste consistency also effectively helps to get rid of stains and contaminations. Apply it to a washcloth and gently treat a stain. If contamination resists such cleaning, you can use wet or dry sandpaper of very fine fraction. In order not to damage the material, do not put too much effort. Then use a special polish for artificial stone in the treated area. • For an ordinary regular cleaning of porcelain sink soap solution is quite enough. Also one of the simplest domestic means helping against light pollution is a lemon – apply the cut side of a lemon to the contaminated area or to the whole sink and then rinse it with water. Lemon also gives a pleasant fresh scent and helps in struggle against germs. • Remember, porcelain sinks should not be cleaned with steel sponges (steel wool), and do not use abrasive powders – you will only spoil the look, scratching the surface. • For minor contamination the paste created of baking soda and some water is also suitable. Apply the mixture to the usual sponge or nylon brush and carefully treat the sink with such a mixture. You can also use trisodium phosphate material, which you can buy at the appliance store. After application of these means you will need to rinse the sink using a solution of lemon juice or vinegar to neutralize alkaline oxidants. • Over the time the white porcelain sink may darken. To restore its former color you should perform a bleaching procedure. For bleaching the sink it is necessary to close the drain hole and fill the sink full of hot water. Then it is necessary to dissolve in water a cup of bleach and leave it for half an hour – an hour, depending on the degree of contamination. Then drain the solution and rinse the entire surface of the sink very well with warm water, and finally wipe it with a dry cloth. • Scratches or cracks on the surface of white porcelain sink can be made almost invisible by using white enamel paint, which you can buy in a appliance or DIY store. Please follow the information on the paint can. Work carefully, using conventional art brush. After the paint dries, apply carefully fine-grained sandpaper and repeat painting. • Here we must remember an important rule – abrasive cleaners, scouring powders, metal sponges, brushes, and similar methods can not be applied. They will scratch the surface of the sink and make it dull. Do not attempt to clean dirt with any sharp objects; the damage of the surface may lead to the metal oxidation. • For daily washing of a stainless steel sink or for removing some minor impurities, warm soapy water is suitable. 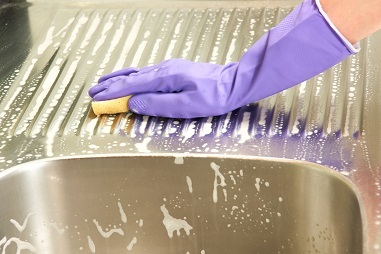 After its application the sink needs to be rinsed and wiped dry. • To add some brightness and gloss to your stainless steel sink, treat it with vinegar solution (to prepare the solution – mix water and vinegar in a ratio of 4 to 1), then again rinse and wipe it dry with paper towel or a cloth. • To make your sink gloss you can also use another “grandmother’s” method: treat sink with some lemon juice, and then polish it with a woolen cloth. The method, though not very modern, but is effective. • Taking caring of a stainless steel sink you must take into account the water hardness. Of course, if your tap water contains natural impurities, and as a result the limestone sediment remains on the sink, the best solution will be water filters. If this is not possible, simply use chlorine containing cleaning agents (be sure to check whether a particular agent is suitable for stainless steel prior to use).